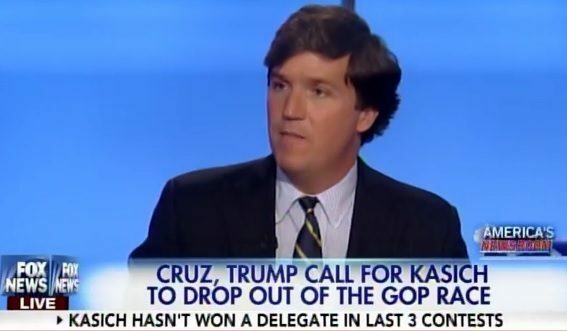 FOX News host and contributor Tucker Carlson weighed in on the current state of the Republican race for president. Carlson argues that Kasich is living in a fantasy world if he believes he can be the nominee after winning only one state. Tucker Carlson: Governor Kasich can stay in the race as long he likes… What I object to is pretending that he can be the nominee. The only way that John Kasich can be the nominee is if he is placed into that spot without regard to what voters did in over 50 state elections. That’s inherently an anti-democratic position. I think it alienates the voters. And I do think it’s an offense against the common assumption we have that these races are decided by ordinary voters and not by donors. … It can’t be one of the three because to bypass the first two in favor of a third, a man who’s won only his home state is to say once more the will of donors matters more than the will of voters. It ought to be obvious.